Stockholm: Reader's Digest Aktiebolag, 2003. 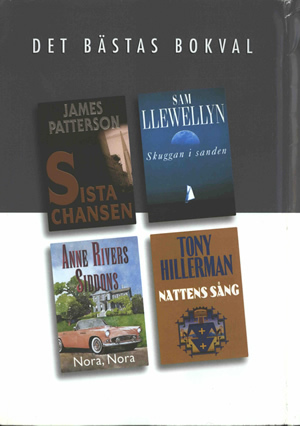 This is a Reader's Digest compilation volume (Det Bästas Bokval) of four novels: Sista Chansen (Second Chance) by James Patterson, Skuggan i sanden (The Shadow in the Sands) by Sam Llewellyn, Nora, Nora (Nora, Nora) by Anne Rivers Siddons, and Nattens Sång (The Wailing Wind) by Tony Hillerman. It was published in 2003 by Reader's Digest Aktiebolag in Stockholm. The top half of the dust jacket is dark grey, and the bottom half is white. The front cover displays DET BÄSTAS BOKVAL in white and thumbnails of the covers of the four included novels. The back cover shows author photographs and names. In the top, gray half of the back cover are color photographs of James Patterson and Sam Llewellyn. In the bottom, white half of the back cover are black and white photographs of Anne Rivers Siddons and Tony Hillerman. DET BÄSTAS BOKVAL, the titles and author names of the four included novels, and the Reader's Digest logo are printed on the spine. The inside front and inside back flaps contain synopses of the four included novels. Binding: Dark grey coated material. "DET BÄSTAS BOKVAL," the titles and author names of the four included novels, and the Reader's Digest logo are printed on the spine in gold.